This past week was National Arts in Education week, and our intrepid Forest View art teacher Marylu Flowers showcased just what’s possible when we have creative, innovative, and thoughtful educators like her in our public schools. While reading art blogs a few weeks ago, Ms. Flowers noticed several artists and teachers talking about National Dot Day, September 15, 2013, in honor of the 10th anniversary of Peter Reynolds’ book The Dot. This book reminds us all to “make your mark, and see where it takes you,” and encourages both children and adults to use their imagination and dream big. Ms. Flowers turned this national celebration into a teaching opportunity. For their art project this week, she read The Dot to first, second, and third grade students, and then worked with them to create a “dot tree” in our Forest View hallway. Students in these classes had the opportunity to connect reading and art, to practice tracing and cutting circles (and work on fine motor skills), to learn new vocabulary words like “concentric circles,” and also collectively create an art project that benefits our entire school community. And, perhaps most importantly, through this project children talked about creativity and imagination, and how to find possibilities in unexpected places. Ms. Flowers’ Dot Tree vision, a display that “allows children’s art to show the creative minds in our school,” is located just across the hall from our Media Center. 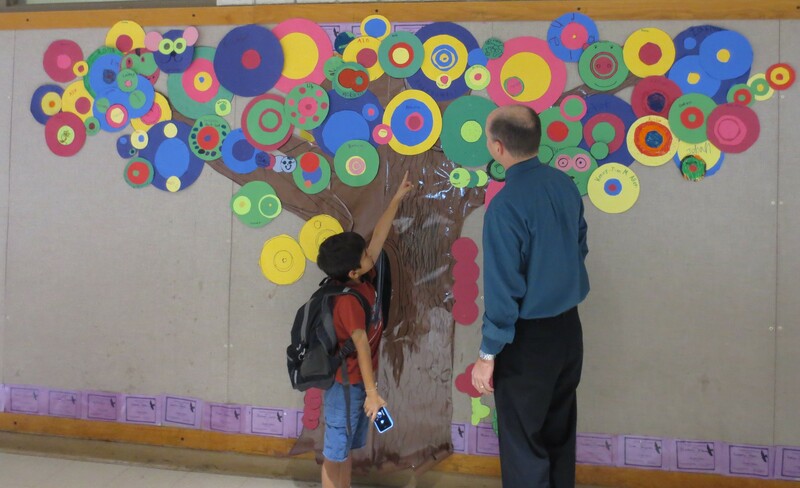 A Forest View first-grader explains the dot tree, about halfway through the creation process, to his dad.